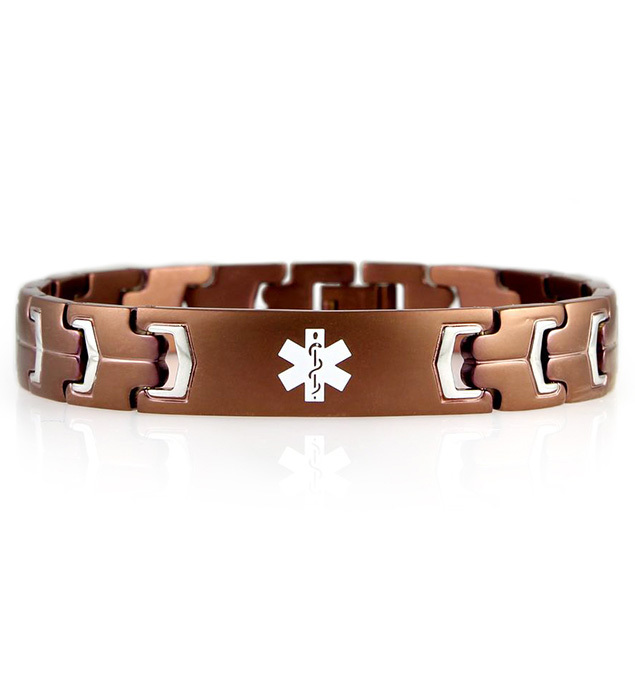 An updated version of one of our all-time favorite styles, the Maverick Medical ID Bracelet is a water-resistant stainless steel medical alert with a matte copper brown finish and stainless accents. This sleek and durable medical ID bracelet bears a white medical caduceus symbol on the front ito alert first responders to your medical information, engraved on the back. This medical ID bracelet features a flip-style closure opposite the affixed ID tag. Comfortable and discreet, Maverick is a custom-engravable medical alert bracelet that’s ideal for any condition or even as an ICE (in case of emergency) ID. Simply list your information in the three available lines, and we will engrave your medical ID so it’s just right for you. Learn more about what to engrave on your medical ID here, or contact us for personal assistance. Need a bit more engraving space? View our interchangeable stainless steel medical ID bracelets for men and women. Opting for one of these styles allows you to choose any of our custom-engravable medical ID tags, most of which allow for five lines of custom engraving. *Please review the Measuring Guide before ordering this item to ensure a great fit.